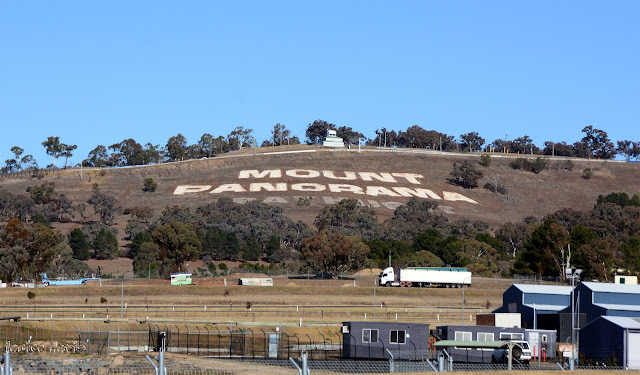 Stayed in Bathurst for a couple of nights in the Caravan Park which there are not many at all. It had been -10degC for two mornings and the hard frost broke 20 water pipes in the caravan park according to the Receptionist. Thanks goodness it was not that cold when we stayed. Never can I recall being in -10degC. The Dunny, not sure if it's workable, it's situated outside at the side of the Office of the Caravan Park. 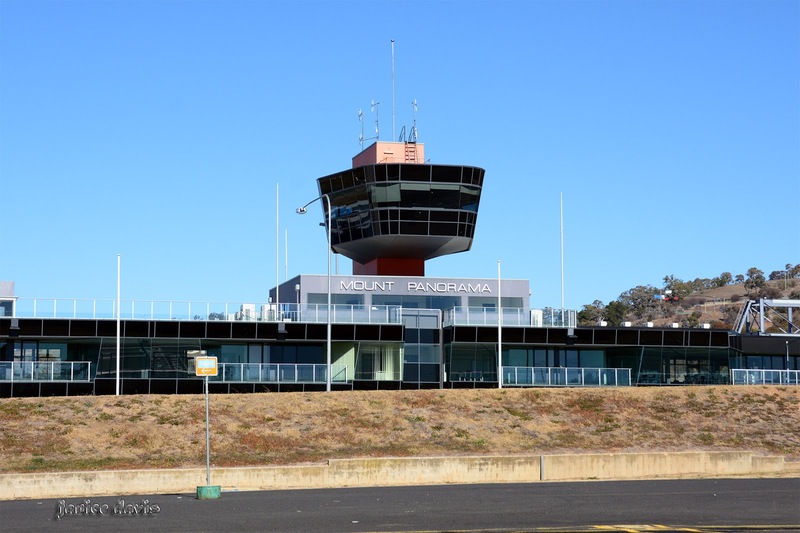 Bathurst is situated about 200 klms North West of Sydney. Bathurst is the oldest inland settlement in Australia. 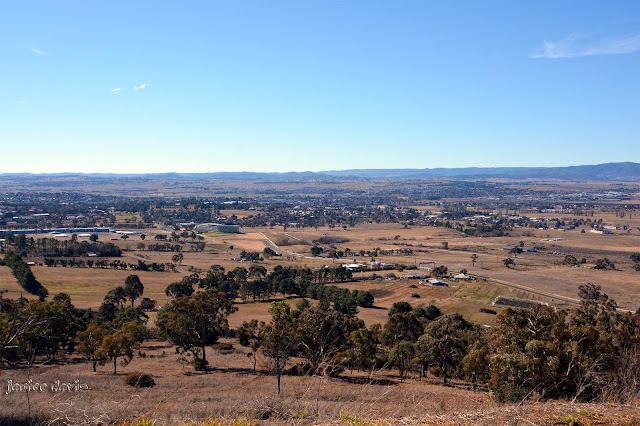 The city is often referred to as the Gold Country as it was the site of the first gold discovery and where the first gold rush occurred in Australia. These days the internationally known racetrack Mount Panorama is a landmark of the city where V8 Supercars are raced there in the Bathurst 1000 being 1,000klm. The public can drive around the racing circuit at the legal speed limit which we did. Pit stop is the pinkish entrance on the left. The above photo speaks for it's self. One of the corners at the top of the mountain. 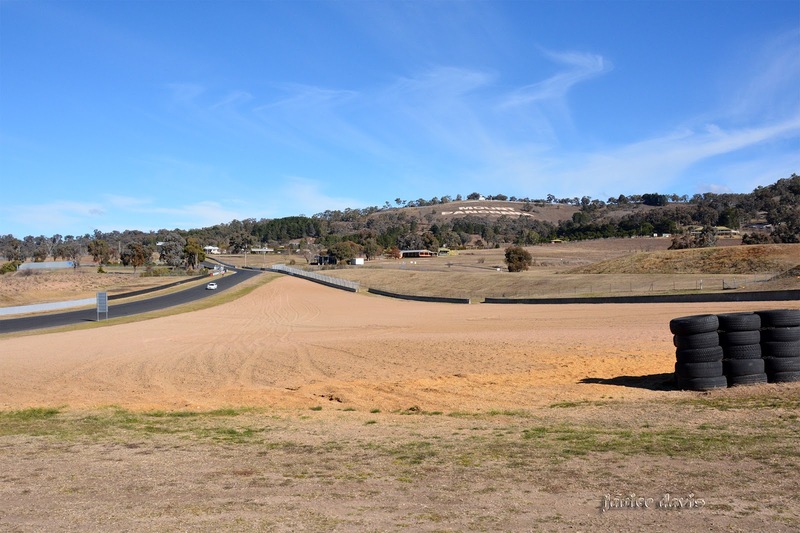 The Sandpit as I call it for the racing cars. 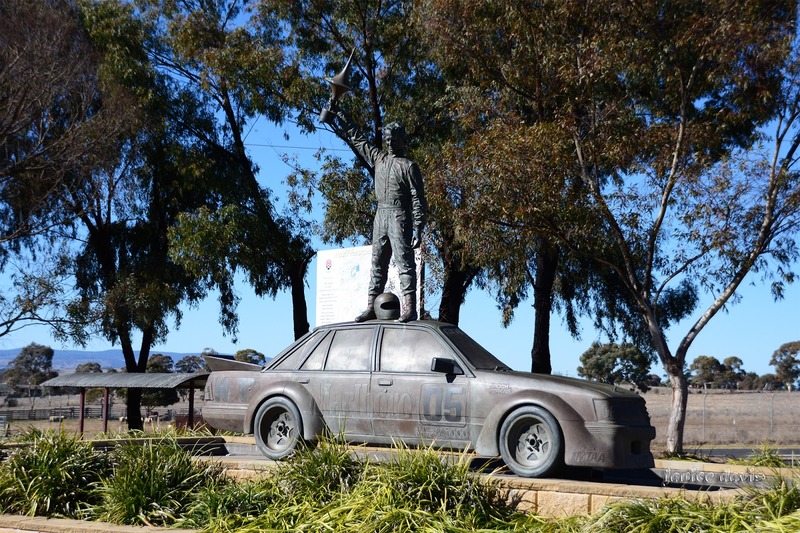 The late Peter Brock is called the King of the Mountain because he conquered the mountain with a Win 9 times. My son would love this place & a drive around the track! The view is stunning & the phone reception Is clearly excellent! Many sons and their father's would like to drive around the circuit, it's interesting and pretty. It must have been fun to try out the car track -- even at a "safe speed". That dunny is certainly conspicuous. Normally they are hidden away out back! Should have asked about that 'dunny' why it was there away from the office. 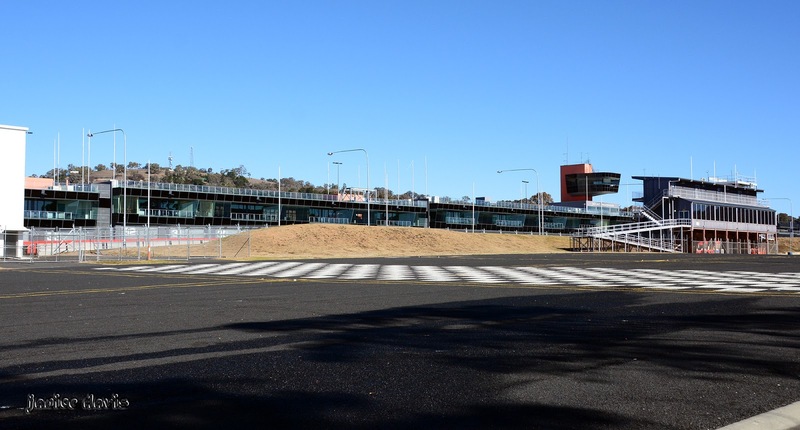 I'd forgotten about the Bathurst race track. Did you pretend you were winners doing a victory lap? We lived in Bathurst for a number of years. Minus 19 doesn't surprise me at all. It is brisk in winter, but a pretty city. Beautiful city, it's a pity we couldn't find a good parking spot to take photos of the inner city buildings. Ahora ha quedado como una aventura más que surgió en el transcurso del viaje y que ha afortunadamente no tuvo muy malas consecuencias. I have never heard of a dunny before! but I am presuming that it is a toilet. Love the "DUNNY". I think it is definitely not in use.......a relic of the old days with maybe a 'Joe Blake" resting behind the seat and under the seat a good old Red Back. I reckon those two would result in that door being opened pretty fast and pants up or down a person flying out!!! Bathurst does get cold in winter but it is really a beautifully maintained inland "city". Great report. I've done the circuit in a car years ago. Brocky would have lapped me a couple of times - ha ha. You are probably correct on the 'dunny' :) actually good to see one as one doesn't see one often these days. 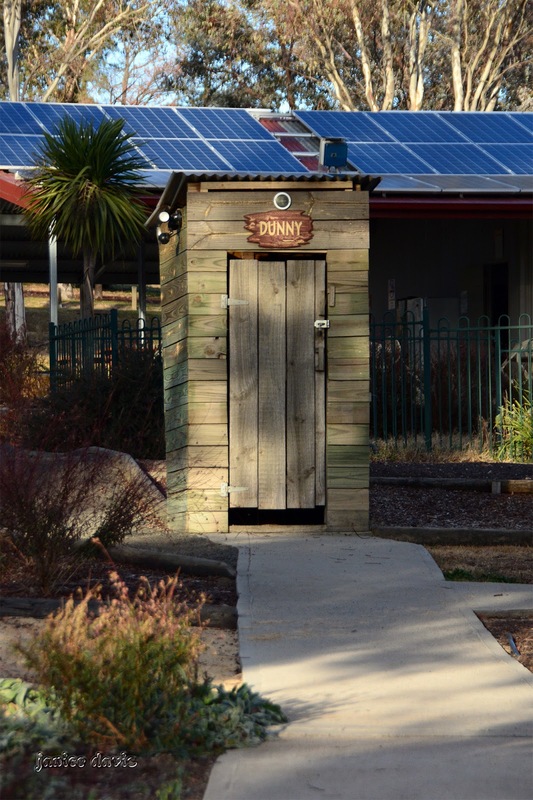 Is that first photo of a solar powered bathroom "Dunny"? Or is it just an ordinary roof? Solar panels are on the roof of the building behind which is a Motel from memory. Colder than I would have thought... Dunny is a new one on me. Fun post. We didn't think it would be that cold there in winter either, so was a bit of surprise. 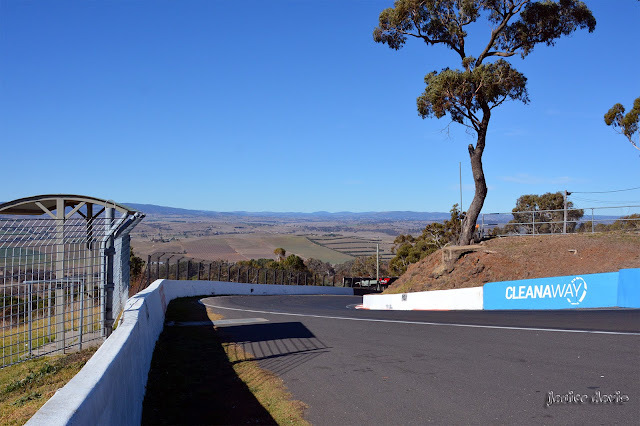 Every year I watch the Bathurst. And in the day I was a huge Brockie fan...got to meet him back in the mid-Seventies. He was great. Thanks for that information that you met the late 'man'. Un magnifico Circuito y excelentes imagenes. I can't even imagine those temperatures in Australia! They certainly exist, we nearly froze but got used to it as we travelled. -10deg C for two mornings ! Brrr - that's cold ! Loved seeing the blue skies though ! Was cold at -7degC for us not used to such low temperatures in the mornings, glad we missed the -10. Gold city near Sidney looks wORTH VISITING!!! thank you for wonderful photos who reveal much beauty and serenity of this peaceful land . Certainly is a land of much peace Baili.